August usually prompts the question “Where have all the garden birds gone?”. To which the answer is usually “into the fields and hedgerows where there is now more food available”. Our house sparrows are no exception. A few weeks ago there were daily family parties of adults feeding their newly fledged youngsters from the millet seed specially provided for them in our garden; now they are only coming in small groups, and I expect visits to get less and less frequent throughout August and September as they take advantage of the natural harvest. They’ll be back in October, especially if it is cold and wet, to prepare for the winter battle against the elements. Along with most other small garden birds, less than half of this year’s young will survive to breed next spring, and a good proportion of adults will also perish if it is a hard winter. 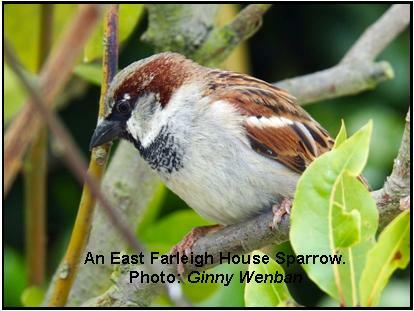 For the past six years I have been taking part in a national project to monitor the survival of adult house sparrows. It is being run by the British Trust for Ornithology (BTO) and is helping our understanding of why sparrow numbers have declined so drastically in the last thirty years. Fortunately it is starting to provide some answers that are leading to ideas for how we can them. The project is based at Frith Farm and the Horseshoes Riding School in Dean Street, and in Vicarage Lane, and is one of eighteen across the country. 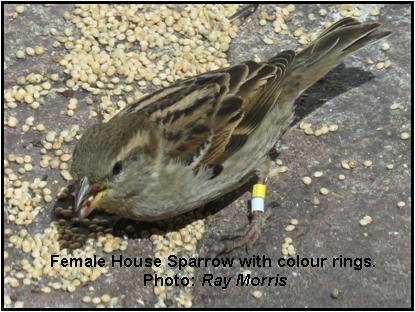 Sparrows are fitted with coloured leg-rings so they can be tracked throughout the year. Data so far show their survival compares less well in East Farleigh (and the South-East generally) with that of those nationally. Results for ‘our’ sparrows show that only 39% of adult males and 36% of adult females survive each year. This compares with 44% and 42% elsewhere. 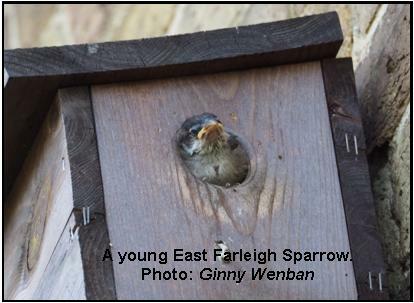 Although sparrows don’t normally travel far from the colony they were born in, it would be interesting to know if any have been tempted by the promise of a better life in West Farleigh! If you see any of them, or would like more information, please do let me know - (01622 726164 / lepiaf@hotmail.co.uk). It is no coincidence that predators also time their breeding so that there are plenty of young, naive birds around when they need extra food to feed own hungry youngsters. 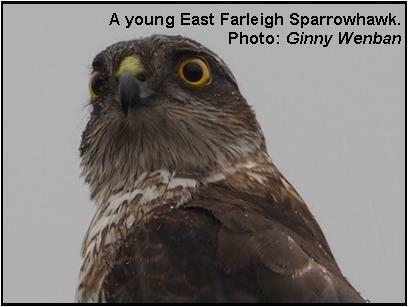 So now is a good time to see sparrowhawks, kestrels, buzzards and owls – all fairly common now in The Farleighs – out hunting for birds, rodents, rabbits and earthworms (the latter a favourite of buzzards and little owls). Of course, the predators’ young, once fledged, are naive too and have to learn how to hunt through trial and error. So you may be lucky enough to see a young, perplexed-looking sparrowhawk sitting near your garden feeders wondering why the other birds all disappeared when he arrived. Like this one, photographed in July in a Dean Street garden eyeing-up the sparrow chick poking its head out of the nest box! Enjoy them while you can.